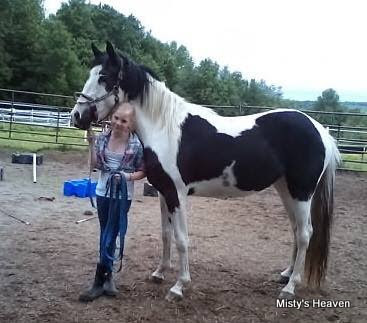 Misty's Absolute Zero, nicknamed Abby, is sired by Misty's Rainstorm and is a full sister to Misty's Ice Princess and Misty's Lightning Flash. She was bred by the Hagquist family of New York. She was later sold to the Leonard Chincoteague Pony Farm on Chincoteague. Abby is the dam of a 2018 smokey black pinto colt sired by Misty's Silver Moon.